A Florida couple ditched traditional wedding and went for an unusual one. 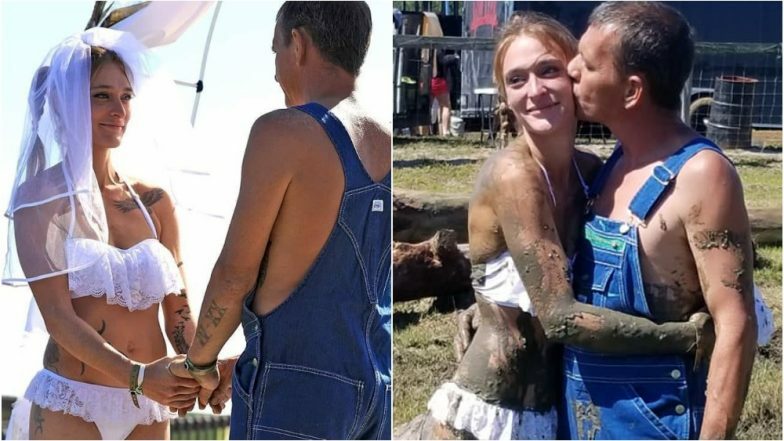 The duo exchanged vows at Punta Gorda's Redneck Mud Park in Florida, United States. Jeremy Biddle and Ahrielle Biddle wanted to have a different wedding and decided to make it a fun event. They thus finalised on a redneck wedding when they got married on a pickup truck. The bride ditched the age-old white wedding gown and wore just a bikini with white ruffles and a veil, while the bridegroom wore an overall. The wedding solemniser also maintained the theme and wore dungarees with a neon green t-shirt. The one of its kind weddings has now grabbed eyeballs on social media. Pictures and videos of the couple's marriage during the Trucks Gone Wild Spring Break event at the park have gone viral on social media. The wedding ended with a splash in the mud. The video shows the bridegroom carrying the bride and dropping her in the mud. With some internet users think it was a great idea to have an informal wedding, many did not subscribe to the idea. Naked Wedding Gowns Are in Vogue For All Bold Brides Out There! Check Quirkiest Wedding Trend 2019 in Pics. They have set up a GoFund Me page where those who loved the low-key wedding contribute to funding their honeymoon. Describing their dream honeymoon, Ahrielle writes, "She really wants to go jeeping in the Colorado Rockies. Please help me make her dream come true. We have so many years to come and millions of memories to make. We promise forever to each other and show all of our fans our future together. Don't forget to donate! We appreciate all of the support and hope to see you all with us on this amazing path ahead." Hero Cat Saves Her Florida-Based Family From Carbon Monoxide Poisoning!